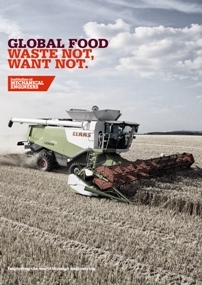 In England the Institution of Mechanical Engineers has issued a timely report Global Food Waste Not, Want Not. The report may be downloaded as a pdf (click here). Readers interested in animal care issues should read the report. There is considerable concern expressed about the wastage of fruit/vegetables harvested. Not all harvested vegetables even reach retail markets, and needless to say not all produce is actually bought let alone eaten. This problem stretches across developing nations and in technologically advanced nations like England, Australia etc. Various problems are identified with food wastage in advanced countries such as consumer fuss over the appearance of produce, “use-by-dates” on produce; and poor storage facilities and poor distribution in less technologically developed nations. The report points to the enormous consumption of water in producing different kinds of foods a studied just in the European continent where pundits might speak of “efficient” farming practices. The consumption of water the report tabulates relative to Europe should give pause for consideration in Australia where water is sometimes scarce and the cycles of drought/flood/fire beset us. While many advocates for animal causes urge people to become vegetarian and/or vegan, there are enormous problems feeding the world with land usage, landfill of waste, water consumption per annum, and much more. The report does contain broad brush stroke recommendations on addressing problems but I remain highly suspicious of the rhetoric surrounding “sustainable economies”, when often times the jargon is like a code-word for people in advanced nations continuing to maintain the status quo of lifestyle at the expense of the rest of the world. On a different note, the next post coming on this blog will be a book review of a newly released work A Faith Embracing All Creatures: Addressing Commonly Asked Questions about Christian Care for Animals, edited by Tripp York and Andy Alexis-Baker (Eugene, Oregon: Cascade Books, 2012; imprint of Wipf & Stock Publishers). This book is volume 2 in a series known as the peaceable kingdom series (click here for more details).